Last, but by no means least, courage - moral courage, the courage of one's convictions, the courage to see things through. 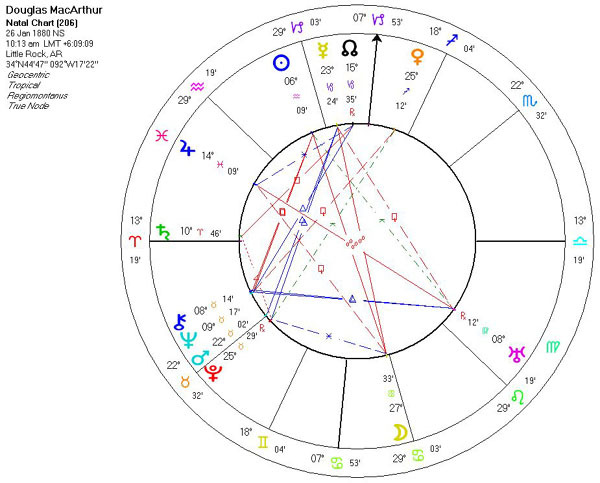 The world ;is in a constant conspiracy against the brave. It's the age-old struggle - the roar of the crowd on one side and the voice of your conscience on the other. No man is enitled to the blessings of freedom unless he be vigilant in its preservation. ATTRIBUTION: General DOUGLAS MACARTHUR, Reminiscences, p. 82 (1964). MacArthur wrote these lines while superintendent of the U.S. Military Academy at West Point, New York, 1919–1922, and had them engraved over the entrance to the gymnasium. People of the Philippines: I have returned. By the grace of Almighty God, our forces stand again on Philippine soil…. The hour of your redemption is here…. Rally to me…. As the lines of battle roll forward to bring you within the zone of operations, rise and strike. Strike at every favourable opportunity. For your homes and hearths, strike! For future generations of your sons and daughters, strike! In the name of your sacred dead, strike! Let no heart be faint. Let every arm be steeled. The guidance of Divine God points the way. Follow in His name to the Holy Grail of righteous victory. ATTRIBUTION: General DOUGLAS MACARTHUR, speech to the people of the Philippines, on Leyte, October 17, 1944.—MacArthur, Reminiscences, pp. 216–17 (1964). 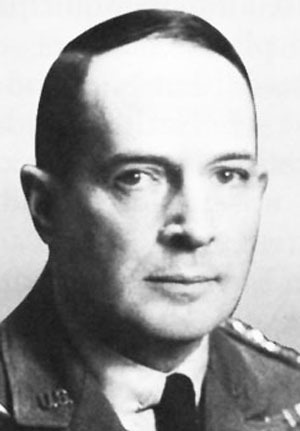 MacArthur committed at least one serious military blunder in the early days of the Philippine Campaign in his disastrous attempt to meet Japanese thrusts everywhere, a strategy based on his exaggerated estimate of the prowess of the Philippine Army. In addition, his failure to transfer the vast food stocks that had been earlier assembled for removal to the Bataan Peninsula resulted in the largely unnecessary hunger that so debilitated its doomed defenders. 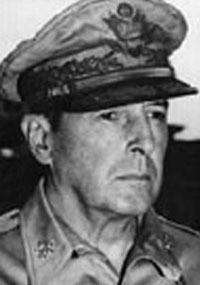 But MacArthur retrieved his reputation by his aggressive defense at Bataan, a defense that seemed all the more the work of a military genius when contrasted to the astonishingly quick capitulation of the other colonial powers in the area, the Dutch and British at Malaya and Singapore. Although he was criticized by some of his troops for leaving the Philippines before the inevitable surrender, his orders came directly from President Franklin D. Roosevelt, and this was one presidential order that MacArthur chose to obey. 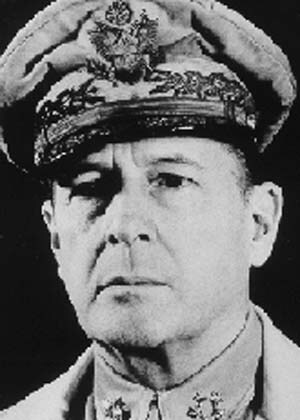 MacArthur was evacuated by patrol torpedo (PT) boat to Australia in March where he was named supreme commander of the Southwest Pacific and began his plans to launch an attack on Japanese power in the Pacific. 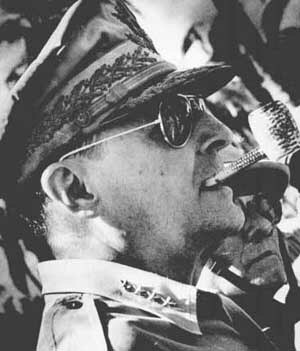 After five months of preparation, MacArthur began a daring counteroffensive against the Imperial Japanese at New Guinea. Bypassing Japanese strongholds (such as Rabaul) and cutting off supplies to the enemy from the Japanese home islands to the north, MacArthur’s armies leapfrogged through the Solomon, Bismarck, and Admiralty islands back toward their destination of the Philippine Islands. With the support of Adm. William Halsey’s forces in the South Pacific and Adm. Chester Nimitz’s forces advancing across the Central Pacific, the Japanese were pushed back throughout 1943 and 1944. 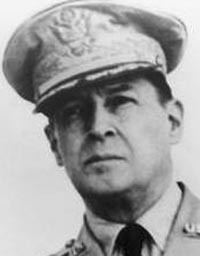 On October 20, 1944, MacArthur’s forces invaded Leyte Island in the Philippines. In December, he was promoted to the rank of five-star General of the Army. On December 15, MacArthur seized Mindoro and, on January 9, 1945, landed in force on Luzon. Through February and March, Allied forces gained control of a devastated Manila, and soon thereafter completed their conquest of the islands. MacArthur was to lead American forces in the invasion of the Japanese home islands, and he was in the process of preparing for that impending and horrific operation when the atomic bomb brought an abrupt and decisive end to the war. On August 15, MacArthur was named supreme commander for the Allied powers, and in that capacity he accepted the surrender of Japan aboard the USS Missouri September 2,1945. From his role of military leader in time of war, MacArthur moved on to a new chapter in his life as the commander of the Allied occupation of postwar Japan. He held that position until 1951, ruling Japan through a series of orders from his headquarters in Tokyo. MacArthur is credited with restoring Japan’s devastated economy, placing the defeated nation’s political future on a sound footing, liberalizing the government, and setting Japan on the road to democracy and postwar recovery. His rule of Japan in this period (in the name of the Allied powers) is usually considered both fair and progressive, and MacArthur claimed, a greater source of satisfaction to him than his military successes. MacArthur tested the waters of politics in 1948 by allowing his name to be placed on Republican Party primary ballots in a number of states in the spring and summer prior to the 1948 election. However, after a disastrous primary defeat in Wisconsin, MacArthur did not actively lend his name to any additional political activities. Still another chapter in MacArthur’s life opened when the armies of North Korea attacked South Korea June 25, 1950. On July 14, the general was named to direct U.N. Forces in the defense of South Korea. With the few and poorly trained troops that were then stationed in Japan, MacArthur fought a holding action against a powerful North Korean army. His forces were pushed down the Korean Peninsula until a defense perimeter was finally established at the southeastern segment of the Peninsula around the vital port city of Pusan. At the end of July, MacArthur flew to Taiwan for two days of talks with Chiang Kai-shek. At the end of these talks MacArthur made a vague announcement praising Chiang’s anti-Communism, but further stated that “arrangements have been completed for effective coordination between American forces under my command and those of the Chinese government.” This sounded suspiciously as though Chinese Nationalist troops were to be introduced into the Korean fighting, which was definitely not U.S. government policy. MacArthur cavalierly refused to give details of his supposed plan to the State Department, and even waited four days to report to the Joint Chiefs of Staff, nominally his superiors, on this important meeting. In spite of his embattled situation along the Pusan Perimeter, MacArthur nonetheless found the time to excoriate administration policy in his message to the Veterans of Foreign Wars (VFW) August 20. He dismissed any threat of the war’s expansion by arguing that as the most knowledgeable expert on “oriental psychology” he knew that most Asians admired his aggressive, resolute and dynamic leadership.” President Harry S. Truman forced MacArthur to withdraw the statement, but mutual ill-will continued to fester between the two leaders. On September 15, MacArthur, now age 70, directed the surprise amphibious landing behind enemy lines at Inchon, just west of Seoul. 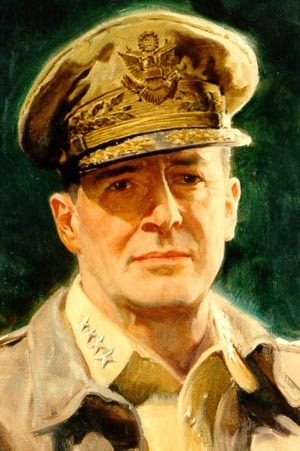 His plan had been opposed by most high military officers in Washington, but MacArthur was able to convince the Joint Chiefs of Staff of its feasibility and the operation succeeded famously. By the end of the month, the North Korean forces began to collapse quickly and were rolled back across the 38th Parallel. On October 8, U.N. troops pushed the enemy north into North Korea and followed in hot pursuit. MacArthur was, of course, only following the directives of the president and the Joint Chiefs of Staff. The following day, he issued an ultimatum to Pyongyang, calling on the North Korean government “for the last time” to surrender immediately and inviting its people to cooperate with the United Nations in creating a “unified, independent, and democratic government of Korea.” The Stalinist premier of the Democratic People's Republic of Korea (North Korea), not surprisingly, ignored such overtures. Many North Koreans collaborated with U.N. forces, for whatever reasons, and had to be evacuated when those forces withdrew. Elements of MacArthur’s command actually reached the Yalu River marking the border between China and Korea by late October. But these forces were divided into two commands, X Corps and Eighth Army, which had practically no communication with each other and which seemed to invite an enemy offensive to destroy them piecemeal. MacArthur refused to believe that the Chinese, firm allies of North Korea, would enter the war in any strength, and opened his “end the war by Christmas” offensive. (Later, and very improbably, he termed this offensive “a reconnaissance in force” still later and even more improbably, he claimed to have “upset the enemy’s timetable.”) Some writers have even contended that MacArthur’s intelligence was good enough that he realized that the Chinese were likely to intervene and welcomed this opportunity for a showdown with Asian Communism. A more considered appraisal of the general, however, would have to conclude that he was neither that clever nor that stupid. MacArthur’s “intelligence failure” is more understandable, however, when it is remembered that his staff was responsible for information on the current enemy, that is North Korea. Determining what other nations, such as the People's Republic of China, might do was up to the Central Intelligence Agency and the State Department. The available records indicate little intelligence sharing or coordination, and blame for that failure can be apportioned all around. On November 24, Chinese forces struck hard, and MacArthur’s divided U.N. troops were pushed back across the 38th Parallel in a matter of weeks. The once ebullient U.N. commander now seemed sunk in gloom and alarmism, which in numerous cases permeated the entire command by the end of the year. U.N. Forces retreated to well below the 38th Parallel. 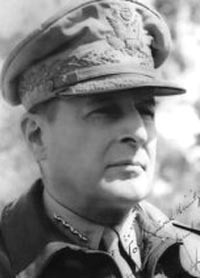 The two U.N. counteroffensives of late winter and early spring 1951 were primarily the work of General Matthew B. Ridgway, General Walton H. Walker’s successor as commander of Eighth Army, although MacArthur gave Ridgway his blessing. But stiffening enemy resistance as their lines of communication shortened brought Operations Killer and Ripper to a halt near the 38th Parallel, but with the ruins of Seoul once again in U.N. hands. MacArthur again called upon the enemy commander, this time not to sign a surrender instrument but to meet with him to negotiate a cease-fire and acceptance of U.N. objectives for Korea. This move was probably designed to forestall peace proposals about to be forwarded by the Truman administration. 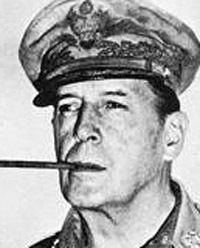 MacArthur may well have wished to torpedo negotiations, and if so, he succeeded. Rebuffed by the Communists, MacArthur called for an extension of the war into China that would pave the way to victory in Korea and an end to Communism in Asia. He advocated the bombing of bases in Manchuria, the blockading of the Chinese coast, and the introduction of Nationalist Chinese forces into the war. This plan was, of course, completely contrary to the policies of the Truman administration, and of the succeeding Eisenhower administration as well, for that matter. Neither, whatever their differing public expressions, had any desire to escalate the limited Korean conflict. 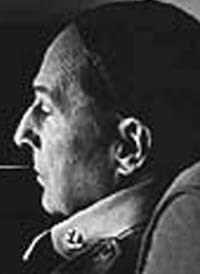 It should be noted also that none of MacArthur’s plans for air or sea attacks stood any chance of execution; they lacked any basis in logic or in logistics, and it is surprising that so experienced a commander would forward them. The Joint Chiefs of Staff were well aware of the deficiencies of MacArthur’s ideas; only later, in their testimony before various Senate committees, did they claim that his ideas ran the risk of igniting World War III. 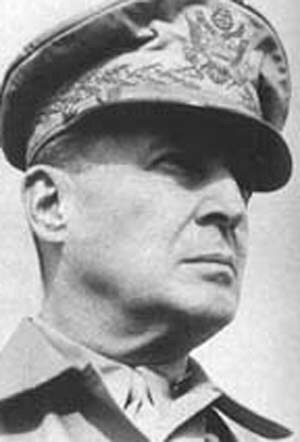 Yet, despite the perfervid rhetoric of some of MacArthur’s opponents, there is no evidence that the general had any intention of overthrowing or even challenging the American constitutional principles of civilian control of the military. 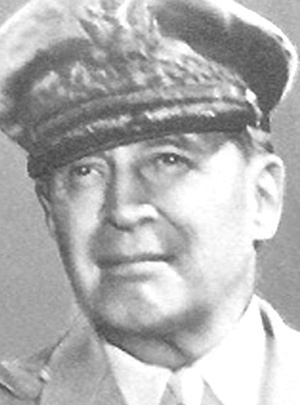 MacArthur was fired for public insubordination. He also deserved at least to be quietly retired for incompetence. At any rate, MacArthur was relieved of his commands by the president April 11, 1951. With the exception of a brief run for the presidency in 1952, (he delivered a listless keynote address at the Republican National Convention that year) MacArthur retired to a quiet private life. 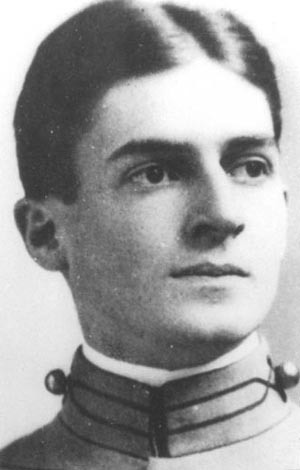 He died at Walter Reed Hospital in Washington, D.C., April 5, 1964, at age 84. History has treated MacArthur as the consummate soldier, a leader of men, but a man who could give orders better than he could take them. For most, he was the genius behind America’s victory against Japan. In Korea, the legacy of MacArthur is usually expressed as much in the controversy that led to his firing as the brilliant landing at Inchon that changed for a time the entire character of the war.